The Derby Festival, which takes place annually at Epsom Downs Racecourse, in Surrey, in South East England, requires very little introduction. The second day of the Festival, a.k.a. 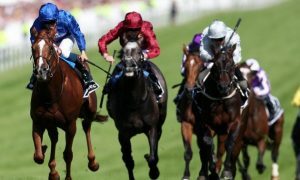 Derby Day, is staged on the first Saturday of June each year and, of course, features the running of the most valuable horse race in Britain, the Derby Stakes. The Derby Stakes, known for sponsorship purposes as the Investec Derby, was inaugurated in 1780 and, apart from a wartime substitute, known as the ‘New Derby’, run at Newmarket, has been run at Epsom Downs ever since. Run over 1 mile 4 furlongs and 6 yards and open to three-year-old thoroughbred colts and fillies, the Derby is sometimes billed as the ‘Supreme Test of the Racehorse’. Certainly, the bends, camber and pronounced downhill gradients at Epsom Downs provide a thorough examination of inexperienced, young horses, as might be expected in the most prestigious, and valuable, of the five British Classic races. Indeed, the Derby has become synonymous with some of the greatest middle-distance racehorses of all time, including Sea Bird, Mill Reef, Shergar, Reference Point and Sea The Stars, to name but a handful. Speaking of British Classic races, the opening day of the Derby Festival, a.k.a. Ladies’ Day, features the Oaks Stakes, run over the same course and distance as the Derby, but restricted to three-year-old thoroughbred fillies. The Oaks Stakes was inaugurated in 1779, a year before the Derby, and took its name from the country estate, known as Lambert’s Oaks, or simply the Oaks, occupied by its founder, Edward Smith-Stanley, 12th Earl of Derby. Also contested on Ladies’ Day is the Coronation Cup, run over the same course and distance as the Derby and the Oaks, but open to horses aged four years and upwards. The Coronation Cup was inaugurated in 1902, to mark the belated coronation of King Edward VII that year, and is often contested by horses than ran in the Derby or the Oaks in previous seasons.